Stolen mails, ripped doors… Identity theft is a scourge that unfortunately affects more and more residential buildings. Thieves usually force the mailboxes cam lock using a screwdriver or simply open them using a master key. Another common issue is residents sharing the building access cards/fobs through the mailboxes, rendering your premises unsecured. Duplicating the mailbox metal key is easy and cheap, it’s as well an easy way to bypass your access control system when your building is equipped with unduplicable access cards or fobs. It is therefore necessary to secure your mailboxes block to prevent any theft or damage. 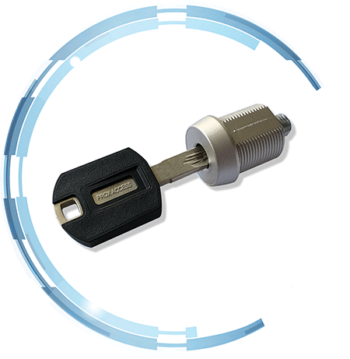 Cylinders Prox Access PRO represent the top in the security of cylindrical inserts. The locking system Prox Access PRO is particularly resistant to so called non-destructive methods of breaking (e.g. picking, bumping, etc.). The key hale plate, made of hardened steel, rotates during attempts to drill it off. These attributes, together with the resistance of the internal mechanism against snapping, put this type of cylinder lock and other products with locking system Prox Access PRO in the highest security level. Highest level: Resistance to chisel attack up to 40 strikes, resistance to twisting attack up to 30 twists, up to 15 kN resistance to cylinder extraction (pull load) and 30 Nm torque resistance. Highest level: Cylinder with high protection against drilling, up to 5 minutes resistance to drilling (net drilling time). Highest level: Resistance to picking and manipulation, where thieves attempt to gain access using specialist equipment. Often, a manipulated lock shows no sign of physical attack. Highest level: Reliable in extreme climatic conditions. High corrosion resistance and resistance to -20/+80°C temperature extremes. Highest level: Patented cylinder profile exclusively sold by Prox Access allowing us to strictly regulate the issue of keys ensuring that registered keys are only ever issued to the relevant customer. Highest level: Durable cylinder mechanism tested up to 100 000 cycles. The base of Prox Access PRO locking system consists of a row of eight rotary discs rotating in nine special inserts, called rotating discs spacers. 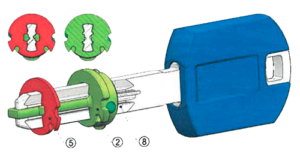 This new patented system is operated by a symmetrical key that can be turned only once it is completely inserted in the cylinder which prevents the cylinder from being damaged. The combinatorics of this locking system can be increased by individual key profiles. 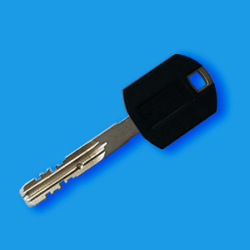 This ensure a high number of locking combinations, which ultimately brings the uniqueness of the key. 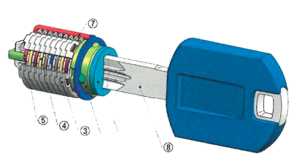 Each key profile is characterized by the cross section of the key profile in a section that passes through the controller and by the cross section in the key end part which passes through the stopper. For small, medium or large strata schemes, the replacement of your old mailboxes locks can be organized by Prox Access. 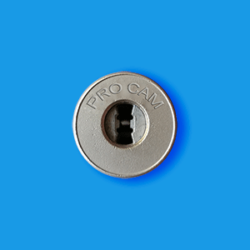 Our CAM locks PRO are also available in a Master Keyed System reserved for Building Manager, Strata Manager and Caretaker.